5pm: Is home time and everyone cycles or takes their moto back home. But today I went to a presentation with the Director of KKO in a hotel in the centre of Siem Reap. Hopefully this will lead to something positive for KKO! 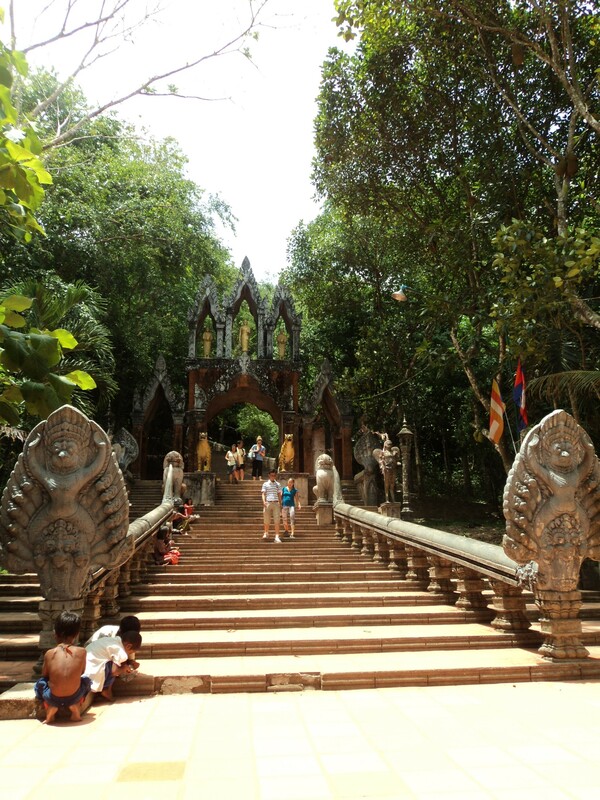 On Saturday I (semi)gate-crashed my colleagues trip to Phnom Kulen – “Mountain of Lychees”. In a minibus we drove to this national park about an hour to the north of Siem Reap. On arriving we first stopped to see the River of 1000 Lingas, where these ancient fertility symbols lie just below the water’s surface. It was then back into the bus for the next stop to visit the site of the reclining Buddha. Shoes were to be removed as soon as we stepped onto this sacred ground – only to be reclaimed afterwards (for a small fee). The last stop on this trip was to visit the waterfalls. After disembarking from the bus we were ushered to a raised picnic area, complete with mats and a roof for shade. A brief rest here and then we were all keen to get to the water. This involved crossing the stream above the waterfall and then climbing down some long and unsteady steps, followed by a bit of clambering over the rocks. Worth it though to see everyone enjoying the water at the bottom. The changing room attendants had everything at the ready costumes and towels for anyone who had forgotten.